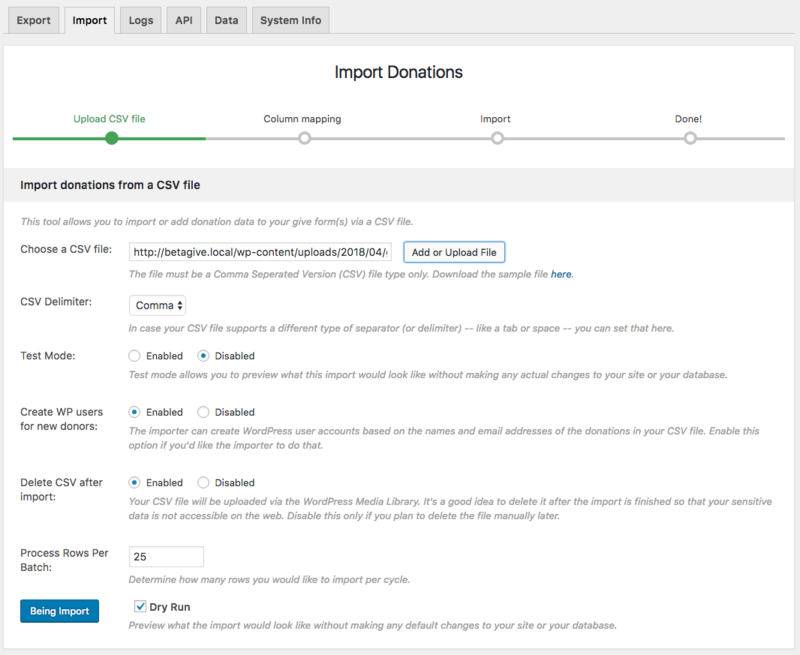 Give has a built-in ability to import donations and donation forms from CSV. This document will walk you through how to do that. The “Import Donations” tool allows you to import donations and forms from your previous donations platform into Give. Imported files must be in CSV format. It works by allowing you to map the columns of your CSV file to any Give field, so you can import as much or as little information as you like. The first step to running an import is to click on the “Import CSV” button. This is the first step in using the Donations importer. Here you’ll upload your CSV file and choose a few simple settings. This allows you to upload your CSV file directly to your Media Library. Note that uploading to the Media Library creates a URL for this file which is accessible via the web for anyone who knows that URL. This is why you’ll see the “Delete CSV after import” option below. By default, most Comma Separated Version (CSV) files use commas for indicating when a new column and/or row occurs in the file. But CSV files also support tabs and spaces. If the file you are working with uses tabs and spaces you can indicate that here. With this setting, you can run the import tool and it will return an explanation of the types of changes that will be made to your site without actually importing anything or changing your database at all. This is helpful to know that your CSV file is properly formatted and that you get the expected number of donations before actually running the import. The importer can create WordPress users for you automatically based on the name and email address of the donors associated with your donations. Keep in mind that this will necessarily mean the import process will take longer. But once all donations are imported and donors created, the new WordPress users will also be associated with their donations and donor profiles and thus be able to login to your site and see their full donation history as well. After the CSV file is uploaded, it will have a unique URL that is publicly accessible. It is best for the security of your donors to make sure that file is deleted after your import is finished. Leaving this checked is highly advisable. Determines how many rows you would like to import per cycle. Preview what the import would look like without making any default changes to your site or your database.